“It’s not the size of dog in the fight, it’s the size of the fight in the dog.” -Mark Twain 1890. Those sayings filtered through my mind as the afternoon crowd gathered at Hanover High School that bright, early September day in 1999. They had just witnessed this diminutive, blonde, 9th grade girl, towered over by her competitors, take off at the sound of the gun, race around the track, down the hill, through the adjoining neighborhood, back up the hill, onto the track, and cross the finish line in first place. Her name was Catherine Bryson, who would over the next four years, win many more races, capture every conceivable accolade and laurel wreath, ranging from Connecticut Valley Champion, Class I Champion, NH State Champion, to New England Champion. She also helped Hanover to two Class I Team Championships. 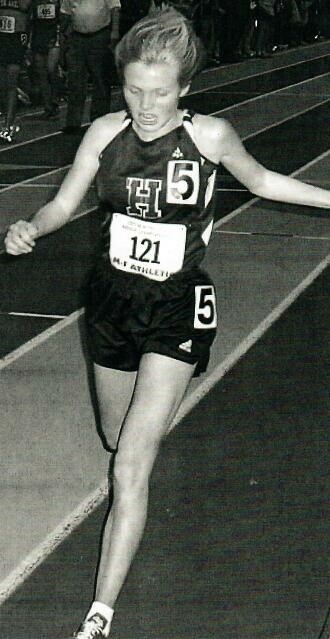 In her senior year of track, she set the state record of 4:50.9 for the 1600. Returning to England after high school, Catherine joined the prestigious Belgrave Harriers Club of London, where she became their #1 female runner. Humility, kindness, friendliness, humor, combined with a British accent, made Catherine fun to be around and respected by all. Mixing those attributes with a strong work ethic, dedication, competitiveness and toughness made Catherine a true champion and wonderful person. 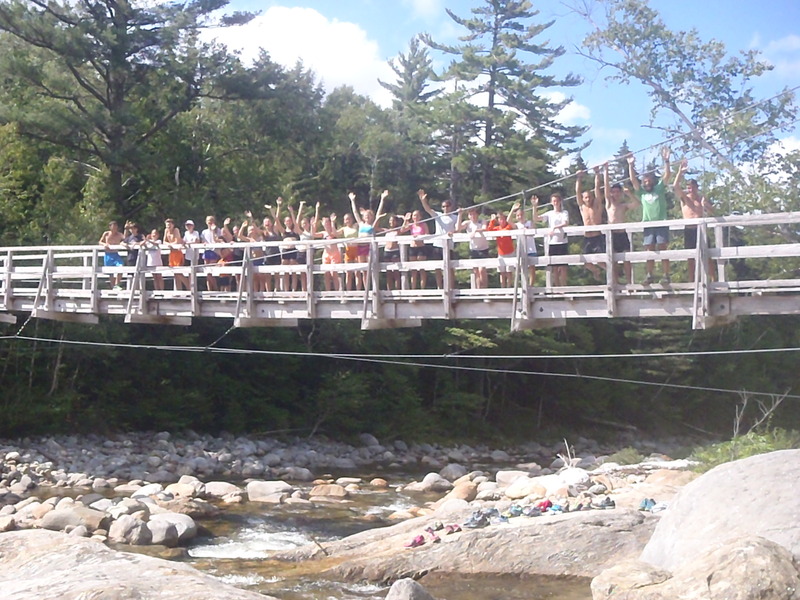 Surely, she had the heart and fight that counted the most when she raced through the neighborhoods of Hanover, over the hills of Derryfield Park or the muddy flats of Maine; Catherine Bryson certainly made the sayings of Mark Twain and those countless coaches throughout the ages come true. You were born in England and moved to Hanover when you were (10 ?? years old.) Was it a difficult transition? When did you first start running? Did you run in England before coming to Hanover?Who got you interested in running? We moved to Hanover the summer before I was to start 5th Grade. I remember it being such an adventure to move to a different country. We had lived in a very tiny village in England where our local school had only 47 children, so everything about Hanover seemed exciting. My older brother David joined the cross country and track teams at High School and encouraged me to join the summer youth programme. I had never run before and I was pretty useless at team sports so it was all a bit of an unknown for me! Describe your first cross country race running for Hanover? You were quite a natural runner, but physically the smallest person on the team, did your size work to your advantage, or did you even think about it? I was absolutely terrified for my first cross country race. Luckily it was a home race which definitely helped. I was convinced I would get lost so I asked my Mum to come the week before and walk the course with me so I knew what I was doing, even though the thought of leading had never crossed my mind! I was definitely self conscious of my height! I used to feel very out of place stood on the line next to all the much taller girls. Once I had a few races under my belt my confidence definitely grew and I don’t think I gave my minuscule size another thought! Describe the Hanover XC running culture at that time. What motivated you to become such an an outstanding runner? The Hanover XC team was pretty small when I was competing, especially the girls team. But I just remember how friendly everyone was and especially how supportive we were of everyone on the team. It was truly a team sport and I loved it for that. I was motivated by Mr Eakin, my team mates and also my family. I knew that I was capable of being successful, but it was the constant support that I always had that made me work hard and remain focused on achieving what I wanted. 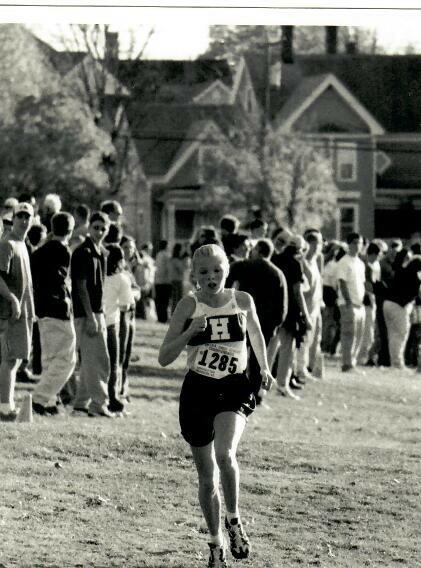 What do you remember from the 2000 Class I State Championship Hanover won, competing with only five girls that day? We were such a tiny team! But we were such a happy one and had such a great time training and laughing together. As much as we had hoped to win that day it felt almost impossible with all the much bigger teams around us, which at times was quite intimidating. But everyone raced so hard that day and really gave everything they could and it paid off. I remember sitting at the awards ceremony and the piercing screams that came out of our mouths when the result for second place was read out. We were all just so happy for each other. It was a great team to be a part of. As you started winning races and championships, the general public, coaches and runners from other teams, and of course reporters started taking an interest in you. What were your reactions to all the publicity? How did you deal with it all? I was such a shy teenager so I found the interviews after races very scary and awkward. In fact I used to hide from the reporters on my warm down and hope someone else would give a quote for me! It was always exciting to see my name in the papers on a Sunday morning, but for me I just loved to run and to race so the publicity side of things went over my head! You set the state record for the 1600 meter (4:50.9)?? in track your senior year. Though you were the New Enlgand XC Champion and one of the top xc runners in the country your senior year, did you prefer competing on the track rather than running cross country. I loved running so much that I was happy both on the trails and track. I was definitely a more confident XC runner, I think the longer races and more undulating courses suited me more. The track races used to make me more nervous and because you can become easily fixated on times there was a bit more pressure. Setting the record for the 1600m in my senior year was definitely a huge highlight for me. I had worked really hard to over come and injury at the beginning of that season and it was a great feeling to win that race and gain the record. After your thrilling New England victory over a runner from Connecticut ( whom you had never beaten), we decided the season was over: no Footlocker Championships, looking back, do you think it was the appropriate decision? It was definitely the right decision and I never once regretted it. My parents and Mr Eakin were always so good at looking out for my best interests and never over pushing me. The cross country season was always a long season starting with pre-training in the summer and not really finishing until November. I never thought I would win the New England Championship that year. It was in fact my junior year when I was more favoured to win and I didn’t ever feel like I had raced my best that day. I then put quite a lot of pressure on myself to really have a good race at the New England Championships and was hoping for top 3! So, when I did win in Connecticut I was so incredibly happy. I wanted to end my senior year on a high with that win and I think if I had kept going to Footlocker it would have just been one race too much. Describe running at Derryfield Park? High points? Low points? 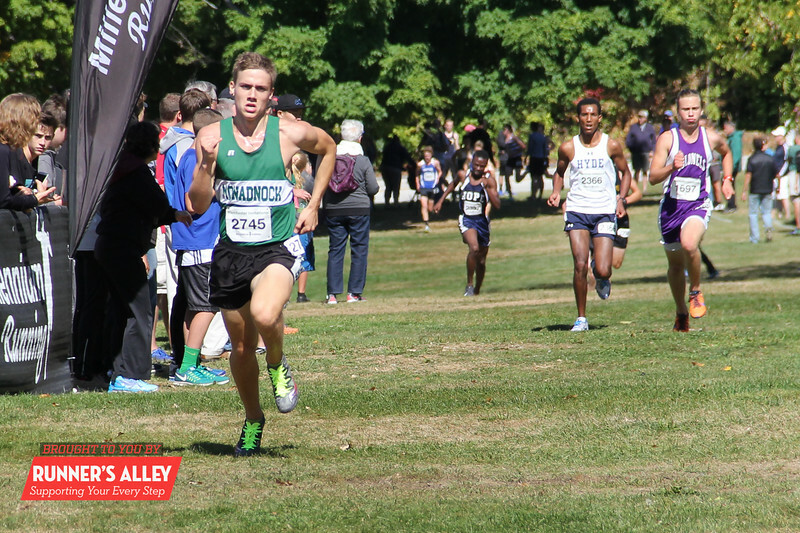 I had very mixed feelings about racing at Derryfield Park! I used to dread the upcoming race on the bus ride there and on the warm up. I used to feel so sick with nerves stood on the bottom of that hill at the start line. Then as soon as the gun went and I was at the top of the hill it all seemed more manageable. It never felt easy though! It always seemed like a challenging course, but the feeling of winning down the home stretch there was amazing. I would love to go back there one day as it holds so many wonderful memories! I still miss all the great places to run in Hanover! The cross country workouts were always my favourite. I loved that the entire team did the session even if it was varied slightly for different abilities. Pine Park was a huge favourite of mine. There was a big hill in there though which we used to do reps on that was a killer! Even now when I think about it I can feel the lactic in my legs! One of my all time favourite days in cross country though was when we played the ‘Marker Game’ which involved Mr Eakin shouting a colour and we all had to run to various points on the golf course to a different team mate that drew that colour marker on different parts of our body. It seems such a silly game now but I remember laughing so hard during those sessions and working really hard at the same time. Cross country was always such a nice balance of working really hard but enjoying each others company. I went home from every XC practice smiling. Yes, I did loads of training in the summer, although I kept quite quiet about this. I felt like that gave me an advantage going into the season. I worked really hard in the summer to get in a good base of training with longer runs and hill reps, but I also did a lot of core and strength work in our basement. I didn’t always want to train as much in the summer vacation, but I knew that if I wanted to succeed then I needed to put in the time when a lot of my competitors would be resting. I used to stick the articles and pictures from the newspapers from any races I wasn’t happy with (ones I didn’t win!) and focused on those as I was working out in our basement. They were a constant reminder that I had to give 110% all the time if I wanted to win. After you graduated, you and your family moved back to England, and you competed for the prestigious Belgrave Harriers. Describe that experience? How different and/or similar was it to competing in high school? I found the transition back to England hard. Running was so different in England it took me a long time to adjust. I was used to having coach and team mate interaction everyday, but in England its much more of an individual sport. It was suddenly quite lonely doing so much training alone and travelling to and from races without a team. I found a club in London that I liked but I never had that support system that I had in Hanover. It was also a frustrating time as I picked up so many injuries after our move. It wasn’t until my mid twenties that I began to adjust to the differences. Describe what life is like now for you, and do you still stay active? Life is very different for me now! I sadly no longer run anymore. I decided to hang up my running shoes in 2012 when I realized I was never going to win the battle against my constant injuries. I now stay fit by running around after my two little girls, Rosie and Lottie. My husband is now the runner in our family and we all enjoy watching him race. I used to find it hard that it wasn’t me racing, but I’m so happy that most weekends we are at a race cheering and supporting. It is a shame I no longer train, but I love that running is still a huge part of my life. I also hope my children will get involved in running one day. Running brought me so much happiness in my childhood and teenage years that I hope they get to experience the same. I remember Catherine being a fierce competitor on the track and the cross country course. I’ve recalled to my team watching Catherine put up 40 points in indoor, winning the 3k, 600m, 1500m and a leg on the 4×400. Tough as nails! Previous post 44th Manchester Invitational! Recap and Results! Next post 2018 Manchester Merges: Accurate Predictor?